As we look back over the past few years of CPNN articles, we find many good leaders in the world today. 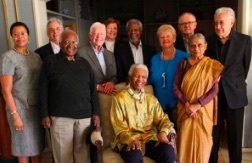 The photo above comes from The Elders, the group of leaders organized under the sponsorship of Nelson Mandela before his death. Below we find articles from the Group of 77 Nonaaligned Nations and UNASUR, as well as many leading individuals, some of which we only come to recognize when they have died, such as Father Berrigan, Julian Bond, not to mention Nelson Mandela. Others are still alive and we need to learn from their wisdom, such as Mohamed Sahnoun, Federico Mayor and the Nobel Women.